The List's annual Eating & Drinking Guide has announced the winners of its reformatted Eating & Drinking Awards for 2018. 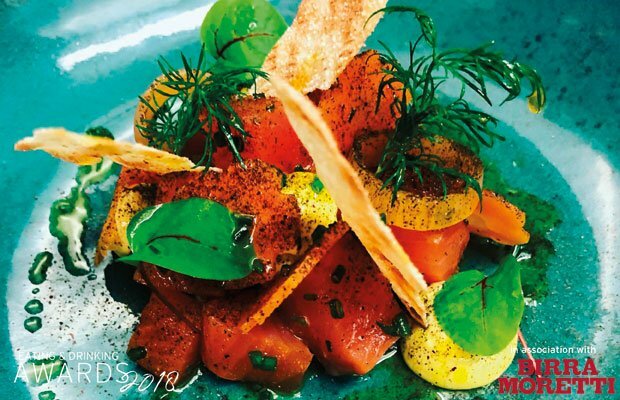 To mark the guide's 25th anniversary edition, the new style for the Eating & Drinking Awards provides a single, exclusive list of eight recipients of the annual award. 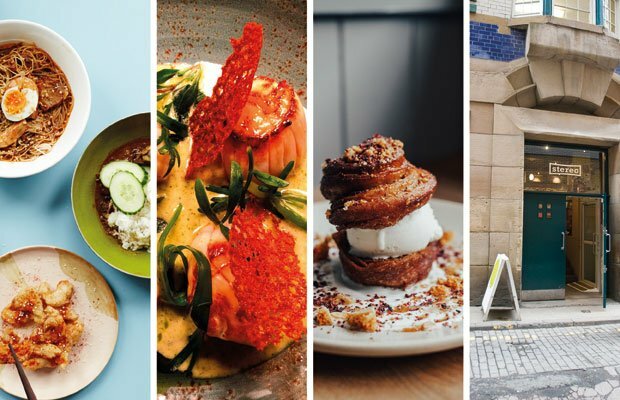 The awards highlight the reviewers and editors' choice of the most exciting and essential places of the past 12 months in Edinburgh and Glasgow across all different styles of the food and drink scene, from fine dining to cafés or street food. 'This year we've covered almost 1000 food and drink venues, including some 160 new arrivals. The awards allow us to highlight the best of these newcomers as well as celebrate one or two individuals who make an outstanding contribution to Scottish food and drink,' says guide editor Jay Thundercliffe. Four of the winners are based in Glasgow (discover our Edinburgh winners). Julie's Kopitiam, or 'coffee house' in Malaysian, is a café established in late 2017 in Shawlands by Julie Lin Macleod, while Monadh Kitchen is a Bearsden restaurant set up by former One Devonshire Gardens chef Martin Thliveros. Quickly established as a popular spot on Hyndland Road, Partick Duck Club is recognised for its all-day and all-night brunch menu, while an award is also made to Craig Tannock, owner-operator of various venues in Glasgow which have championed local music and vegan dining including Mono, Stereo, The 78, the Old Hairdresser's and the Flying Duck. In addition, the newly published guide announced the results of its annual Readers' Awards, made in association with Birra Moretti, a poll conducted in recent months online with thousands of readers voting for their favourite venue in each city. Winner of the Glasgow poll was Shawlands Café Strange Brew, with runners-up Potluck café in Strathbungo, and Malaysian newcomer on the Southside, Julie's Kopitiam. After popping up at various culinary goings-on as Julie's Street Kitchen, including the former street food hotspot Gordon Lane, Julie Lin MacLeod has brought her take on Malaysian cuisine to Shawlands. The former MasterChef 2014 quarter-finalist and chef at Babu Bombay Street Kitchen, as well as a regular cookery presenter on STV Glasgow, has kept things casual at her compact kopitiam (Malaysian for 'coffee shop'), which is based on a favourite spot she used to visit in Melaka, where her grandmother is from. Her modern takes on hawker-style comfort foods, such as nasi goreng and char kuay teow – a smoky noodle dish, have people flocking to this new Southside favourite. Taking over a Bearsden venue that's seen a host of bistros come and go over the years, Monadh Kitchen is the first solo operation for a husband and wife team with a wealth of experience in the game. Chef-proprietor Martin Thliveros has worked in the kitchens of Cameron House, One Devonshire Gardens and as executive chef at Blythswood Square, while partner Sharlene, as event co-ordinator at Hotel du Vin, shares an equally impressive background in the trade. What they've created together at their smart yet informal restaurant is to be applauded, with food and service that shows great care, passion and skill at every turn. It was never going to be easy following the popular Rio Café when it closed last year, but Ross McDonald and Greig Hutcheson have made this corner diner in the Hyndland-Partick area a must-visit destination. Having worked together for nearly two decades, the lion's share of that at the Zique venues straight across the road, there's clearly a smooth synergy to operations in this good-looking venue, which taps into a little local history for the name. Also joining them is former Cafezique head chef Stuart Percival, busy conjuring up dishes that trot all over the globe for influences, with an all-day and all-night brunch menu that is certain to brighten anyone's day. What began initially with the 13th Note on Glasgow's Glassford Street in the 1990s, has today become a whole stable of venues across Glasgow – Mono, Stereo, the 78, the Old Hairdresser's and the Flying Duck – and now Edinburgh with Harmonium. Craig Tannock's empire dishes up animal-free dining, and alone carried Glasgow's reputation as a vegan-friendly city for many years before being joined recently by other plant-based establishments. As a self-confessed boy in a band that never made it, his venues are shot through with great music, including live gigs and a vinyl shop in Mono – playing no small part in what has made Glasgow one of Europe's most famous cities for music. 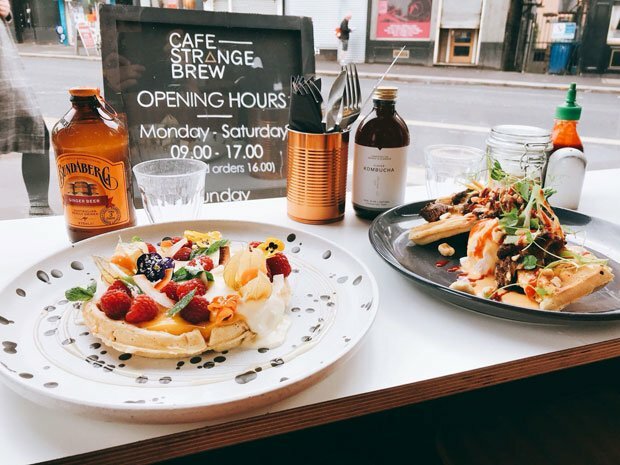 When Laurie MacMillan first set up Café Strange Brew in 2015, there wasn't a whole lot to attract the discerning diner to Shawlands. With the mantra to 'Keep Shawlands Strange', she set about creating a café whose reputation keeps growing, even as she crossed the street to new premises in 2017. Friendly, funky and with an imaginative menu that offers a global flavour to inventive breakfasts, brunches and more – plus consideration for special dieters, this café has been an important trailblazer in the current food and drink scene on the Southside. Opened in 2017 by co-owners Laura Stuart and Lorna Rae Sutton, POTLUCK soon picked up a steady stream of fans out to eat – and photograph – their range of well-crafted and eye-catching brunches. From their famous 'hot cakes' – thick pancakes with fruit and sauces, to global dishes such as Hawaiian poke bowls, the food has the design-conscious café bustling with appreciative diners. With a reputation built up thanks to a MasterChef quarter-final, pop-up appearances at street food gatherings in Glasgow and a bit of STV cooking, Julie Lin MacLeod had plenty of followers waiting patiently for her first permanent spot in Shawlands. With only 20 covers, her kopitiam soon fills up with diners out to enjoy her take on casual Malaysian cuisine. The 176-page List Eating & Drinking Guide 2018 is available from bookshops, newsagents and online, priced £7.95. Michelin Bib-winning and impressive neighbourhood bistro serving contemporary Scottish cooking at accessible prices. Comfy sofas, laid-back service, good music, craft beers and low low prices at this West End vegan café-bar. Long-established music bar with live bands, a record shop and vegan-friendly dining, plus fizzy pop brewed in-house.